When I blogged A-Team (2010) I said, amongst other things, that it was good Saturday night viewing being both amusing and entertaining. 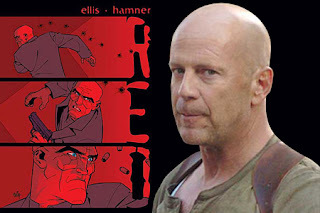 Well it’s much the same for German director Robert Schwentke action comedy Red (2010) that is based on a short graphic novel by Warren Ellis and Cully Hamner. It’s the type of film that you know you shouldn’t admit to enjoying, but to hell with it, it’s a cracker. Red stands for “Retired, Extremely Dangerous’ and describes the Bruce Willis character Frank Moses. Frank has retired as a CIA agent; he now lives a quiet suburban life the highlight of which is his regular telephone chats with Sarah Ross (Mary-Louise Parker) who deals with Franks pension payments. Our brave CIA agent eventually askes her out for a date. But in the mean time Franks house is shot to pieces by a band of hi-tech assassins and it does not take Frank long to realise that someone has made him a target. 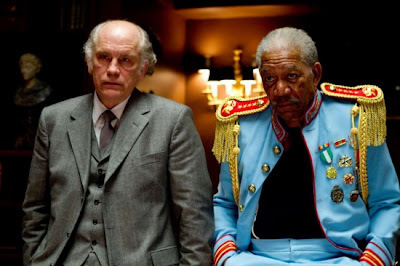 To find out the reason for this intrusion he visits an old peoples home where another retired agent resides, the ex intelligence expert Joe Matheson (Morgan Freeman). They discover that a reporter has been murdered because of a list of names that she has been compiling. Our intrepid duo decide that they need help to get to the bottom of the mystery and recruit two other retired agents one of which is Marvin Boggs (John Malkovich) who lives on the edge of a swamp and has had his brain fried by eleven years of CIA LSD experiments. 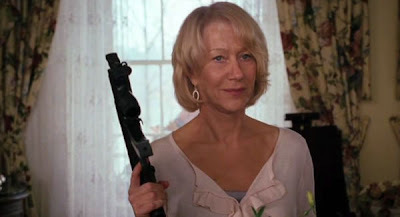 The final retiree is the still beautiful Victoria Winslow (Helen Mirren) a valued member of the local women’s institute and occasional assassin, well she’s got to keep her hand in!! Along with Sarah, who has fallen for Frank and the excitement of the chase, they all set about shooting and blowing up things. The film is not designed to be looked into, but to be looked at. It never misses a beat, has great action scenes, it’s extremely funny at times, has a cast to die for who seem to be enjoying themselves. As I said before it’s a cracking light hearted action adventure that fun and entertaining. Treat yourself. Marvin Boggs and Joe Matheson.